We feel like Oscar turned a corner in the last 24 hours! He had been experiencing increasing abdominal pain Wednesday afternoon and evening so, at Dr. C’s suggestion, we tried a more aggressive intervention to get him some relief. Oscar wasn’t happy but he felt much better afterward. And today’s X-rays confirmed that he does not have Superior Mesenteric Artery syndrome. No barium swallows, no N-G tubes, no return visits to Mt. Sinai. I can’t tell you how relieved we all are. 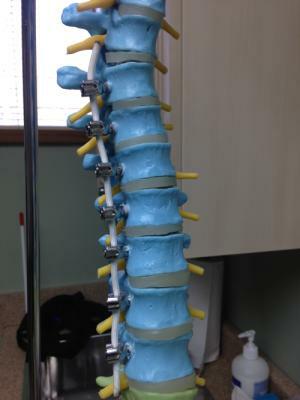 However, it seems like these next few weeks are going to be focused more on the GI tract than his spine. We’re still pureeing his food and will be fiddling with medications trying to get the right balance as he heals both gut and spine. Even with all the progress last night he was still having trouble getting food down at lunch because of discomfort. I’m realizing, and all you parents of kids with Prader-Willi Syndrome will agree I’m sure, that GI issues in PWS just cannot be underestimated. Through it all Oscar’s spirits have been great. We stopped in Princeton today on the way back from seeing Dr. B. Oscar had enough energy to walk around for a bit in the 35 degree weather and enjoyed browsing in a local toy store – making a beeline for the book section, of course. After a three hour nap he was energetic and talkative tonight — a big improvement over last night so we’re moving in the right direction. We’ll be laying low this weekend hoping to have him in good shape for flying home on Tuesday! 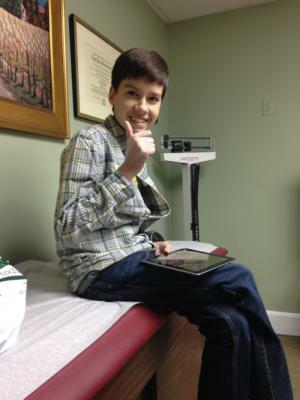 Here he is in Dr. B’s office, obviously feeling well. And, thought you all might be interested in seeing a model of the hardware they inserted – the screws and the nylon cord or tether. 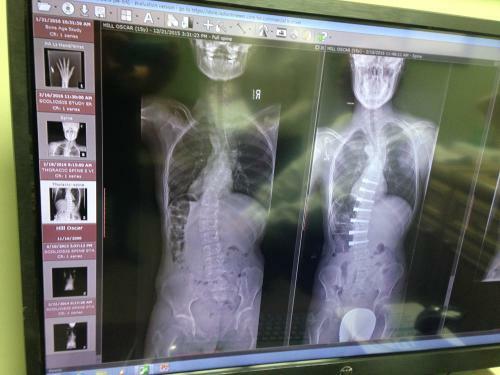 Finally, his before and after xrays…I’m eager to watch his curves continue to improve over the next months and years as he nears his final height.